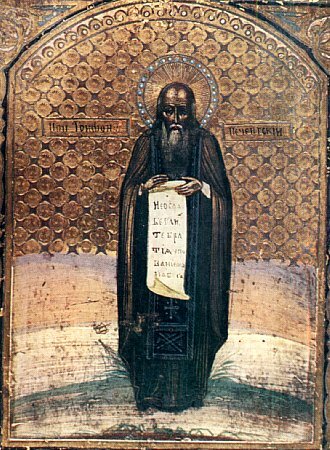 The Monk Tryphon of Pechengsk and Kol'sk, in the world Mitrophan, was born in the Novgorod governance into the family of a priest. The pious parents raised their son in the fear of God. From his early years Tryphon had resolved to devote his life to apostolic deeds and to go with the preaching of Christ to the pagan Lopar people. He knew of them only threw the accounts of fish-vendors. Once during a time of prayer in the forest he had heard a voice: "Tryphon, an empty and thirsty land awaiteth thee". Forsaking his parental home, the saint went out onto the Kola Peninsula and halted at the banks of the Pechenga River, where dwelt the Lopari. There he began to carry on trade with them. The saint first acquainted himself with the pagan beliefs of the aboriginal people and studied their language, and then began to preach the Christian faith to them. The Lopari greeted the words of the saint with acute mistrust. The holy preacher had occasion to suffer much hardship, to endure hostility and even beatings. But gradually, by his wise and kindly words and mildness many were converted to Christ. With the blessing of the Novogord Archbishop Makarii, the Monk Tryphon together with Blessed Feodorit (Theodorit) and the priestmonk Ilya built a church for the newly-converted; and for those fervent for monastic life he founded in 1532 the Pechengsk Trinity monastery – "of the cold sea, on the frontier of Murmansk". Tsar Ivan the Terrible helped him and richly endowed the monastery. The Enlightener of the Lopari died in old age in 1583, having lived at the Pechenga almost 60 years. Local celebration was established soon after the death of the saint. In 1589 the Swedes destroyed the Pechengsk monastery. Later on, by order of tsar Feodor Ioannovich, the monastery was transferred to the Kol'sk Peninsula. On the site of the restored monastery was built a church in the name of the Monk Tryphon, and over the grave of the saint was constructed a church in honour of the Meeting (Sretenie) of the Lord. Saint Tryphon has many a time come to the aid of perishing seamen, who with faith called upon his name.